I love tiramisu and think it is a nice and easy dessert to assemble when you have guests over. You do it in advance, it takes very little time and tastes delicious. I thought it would be fun to mix it up and try new flavors.... 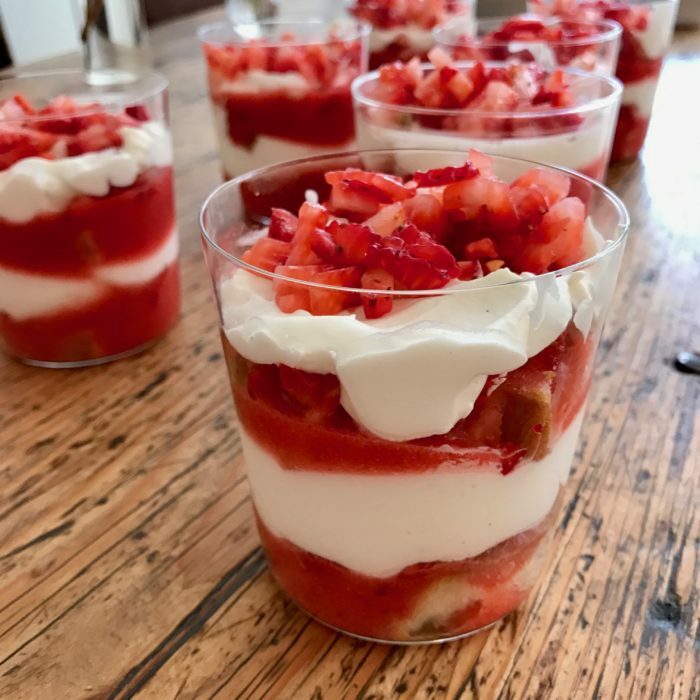 This version with strawberries turned out to be fresh, creamy and super tasty! Mix the whipping cream and mascarpone until soft peak, adding 1 tsp of vanilla extract and2 tbsp of maple syrup. Blend 1 cup of strawberries with the orange juice and 1 tbsp of maple syrup until smooth and runny. Cut the rest of the strawberries into little piece. Start assembling in individual jars or glasses. Dipp 2 lady fingers in the strawberries juice, place add bottom of glass, add some cut fruits, some mascarpone mix and start over again finishing with fruits on top. Keep on assembling until you have 5 or 6 beautiful strawberry tiramisu. Let them rest in the fridge for a couple of hours, it will taste better as the flavors will have had time to rest and blend. Sprinkle some powder sugar on top just before serving.